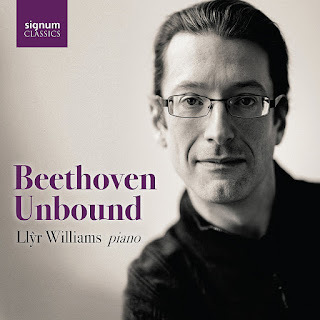 The Welsh pianist Llŷr Williams' latest recording, Beethoven Unbound, has just been issued on the Signum Classics label. The set is the culmination of his cycle of Beethoven piano sonatas performed at the Wigmore Hall and the Royal Welsh College of Music and Drama, and features his recordings of the complete Beethoven piano sonatas plus other works for solo piano recorded live at the Wigmore Hall in a handsome boxed set with an introduction from Llŷr Williams, and extensive notes from Misha Donat. I recently met up with Llŷr to find out more about the background. The fact the recordings were made live is deliberate. 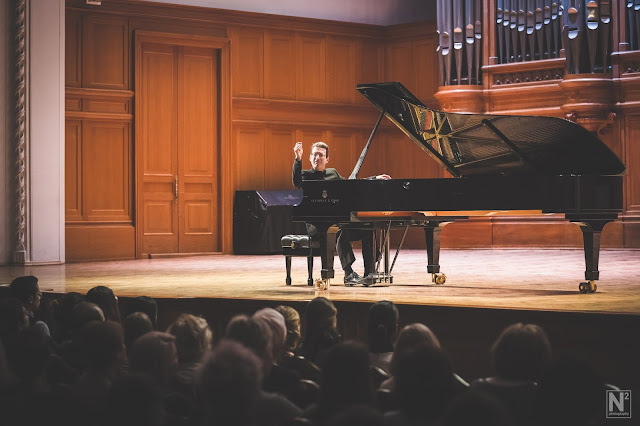 Llŷr explained that John Gilhooly asked him to do a Beethoven cycle, performing all the piano sonatas across nine concerts at the Wigmore Hall (from October 2014 to May 2017), repeated at the Royal Welsh College of Music and Drama. In fact, the concerts would require more than the 32 sonatas, which is how Llŷr came to include the variations and the bagatelles. Llŷr knew the record producer Judith Sherman, with whom he had worked before, and it was she who suggested recording the concerts live and releasing them as digital downloads. Llŷr then ruefully comments that as not enough people were finding the digital downloads, they decided to release the entire set of recordings in a box! The set includes all the piano sonatas and what Llŷr describes everything by Beethoven of a high enough standard. The Diabelli Variations Opus 120 had to be included, and he also recorded two of the three sets of Bagatelles (Opus 33 and Opus 126), the Eroica Variations Opus 35, the 32 Variations in C minor, as well as the Andante Favori which originally belonged to the opus 53 sonata, and is included on the same disc as the sonata so that listeners can make their own version of the piece, as Llŷr thinks Beethoven intended. Rather than being performed and recorded in historical date order, Llŷr assembled them into programmes mixing the well-known and the less well known. He points out that having a couple of named sonatas in a concert helps to bring in the audience so that in the first concert he included the first three sonatas and the Appassionata, and in the second he included the Moonlight. He has done a number of Beethoven sonata cycles, including in Perth in 2010 and in Edinburgh in 2012, and sometimes has performed the pieces in chronological order and sometimes taken a mix and match approach. Such cycles work, Llŷr feels, because they create a journey for both the performer and the audience; complete cycles of the sonatas work because Beethoven provides so much variety, he never seems to repeat himself so there is lots of variety for the audience to listen to. Llŷr adds that you cannot say this about every composer and that complete cycles for some composers do not always work so well. Recording live is a challenge, but they recorded all the rehearsals so that there was scope for some editing, Llŷr adds that if you make a big mistake then it is no good this ending up on the CD, and they also needed to remove the coughs and sneezes. There is never a perfect moment to do such a recording, Llŷr feels that you always want to change something and if he listens to the recordings in two years time he will be unhappy with them. But for Llŷr, there comes a point when he is sufficiently satisfied with his performance that it can be released. And he wanted to get to that stage with the Beethoven sonatas and feel able to move on. His next project is another cycle, this time Schubert sonatas which will be released, he hopes, in 2020. He will not be performing the complete Schubert piano music, there will be nine out of the 12 sonatas, the impromptus and the Wanderer Fantasy. Certainly, Llŷr will not be including every note Schubert wrote for the piano and will omit the various suites of ländler and dances. But Llŷr will be including some intriguing extras, each CD will include three of Liszt's transcriptions of Schubert's songs [amongst Llŷr's previous recordings is Wagner without words, a disc of transcriptions by Liszt and others]. He will be performing the Schubert cycle in five concerts over two years at the Royal Welsh College of Music and Drama. He can think of no other composer whose piano music he would include in a complete cycle. He loves Schumann but feels that there are so many multi-movement works that are similar, so, for instance, works like David's Bundler Tanze and Kreisleriana don't work well together in the same concert. Llŷr has also recently complete a cycle of Beethoven's piano concertos, performing them over two years with the Scottish Chamber Orchestra (though alas he has not recorded them) directing the orchestra from the keyboard. Llŷr does some directing from the keyboard (not as much as he'd like to) but also performs the works with a conductor. Directing from the keyboard is a challenge, but it has its advantages. He comments that some of the opening orchestral tuttis are so long that his fingers get cold and he likes to be doing something! Also, in some of the tricky places in the pieces, you have to transfer your intention to the conductor who then transfers it to the orchestra, and Llŷr feels that it more direct if he simply makes a gesture with his hand. He also admits that he does not agree with every conductor and prefers directing from the keyboard, but that the orchestra needs to be used to it. 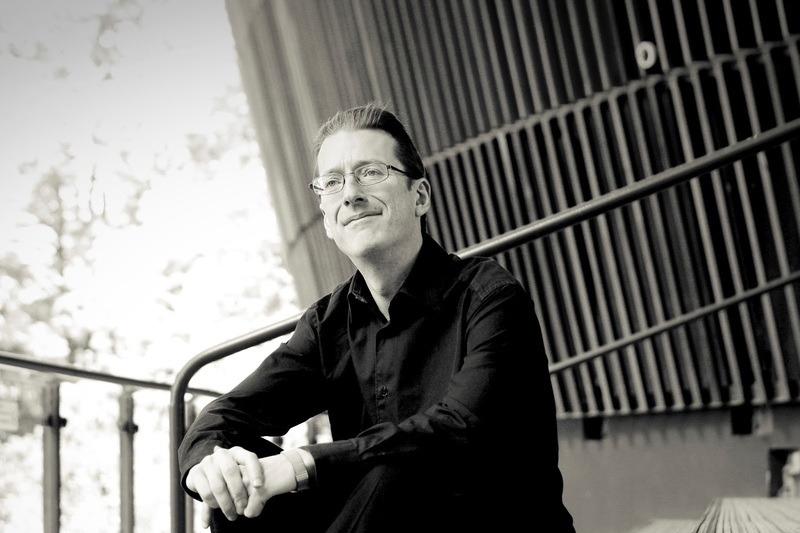 He has worked regularly with the Scottish Chamber Orchestra, directing them from the keyboard, but he has worked a lot with the the BBC National Orchestra of Wales (BBC NOW) and never tried directing them as they rarely work without a conductor. Llŷr has been a pianist since he was seven, and has been a music-lover before than. Though his parents are not musicians they liked to listen to LPs and encouraged Llŷr who picked up a lot. They bought him a piano for his seventh birthday to see if he liked it and he did, he was a very quick developer at the beginning. He did not always plan to be a professional pianist however, he toyed with the idea of being a conductor and did a lot of lieder accompaniment at college [he read music at The Queen's College, Oxford and then studied at the Royal Academy of Music]. After college he considered a number of music-related jobs, and ended up doing what he describes as 'hack work', not sure what to do. In 2002 entered the YCAT competition, and as a result they provided him with professional management for a number of years and he was encouraged to become a full time pianist. 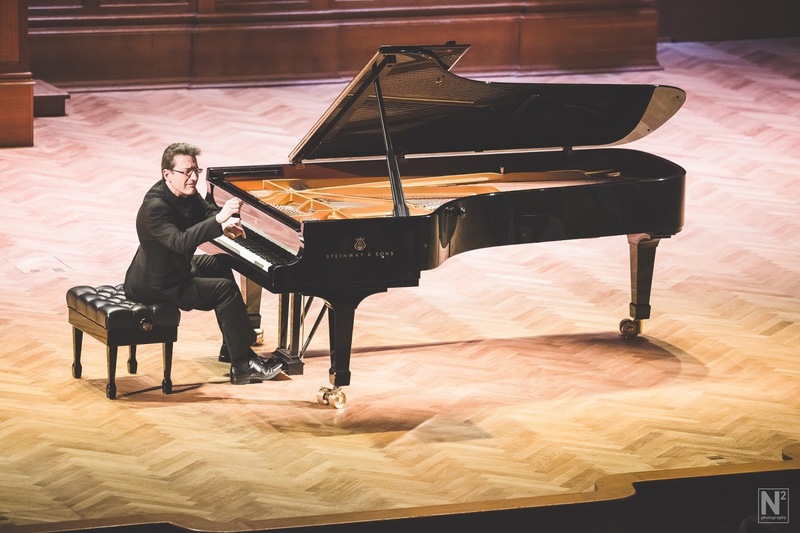 Looking ahead, Llŷr has a concert in the Beethovenhaus in Bonn in June and will be giving the opening recital of the Southbank International Piano Series on 3 October with a programme which includes Brahms' Sonata Opus 5.